Nowhere is there another lab like Dr. Bill Bass's: On a hillside in Tennessee, human bodies decompose in the open air, aided by insects, bacteria and birds, unhindered by coffins or mausoleums. At the 'Body Farm,' nature takes its course, with corpses buried in shallow graves, submerged in water, concealed beneath slabs of concrete, locked in trunks of cars. As stand-ins for murder victims, they serve the needs of science -- and the cause of justice. For thirty years, Dr. Bass's research has revolutionized the field of forensic science, particularly by pinpointing 'time since death' in murder cases. In this riveting audiobook, he investigates real cases and leads listeners on an unprecedented journey behind the locked gates of the Body Farm. A master scientist and an engaging storyteller, Bass shares his most intriguing work: his revisit of the Lindbergh kidnapping and murder, fifty years after the fact; the mystery of a headless corpse whose identity astonished the police; the telltale bugs that finally sent a murderous grandfather to death row; and many more. Forensic science and murder investigations are among the most fascinating topics of our time. Dominating television and print media the subjects could not be hotter. 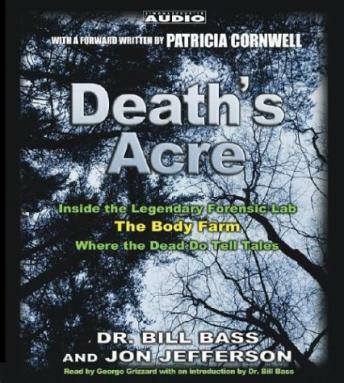 As one of the world's leading forensic anthropologists, Dr. Bill Bass is the premier guide to this unusual realm. I found this book a fasinating learning experience. The reader was EXCELLENT. I laughed, I was sad at things that drive people to do horrible things to others (KILL,mame ect). Most of all I now appreciate so much what forensic scientist do and have to go through to solve cases. I want to thank them for what they endure (sights, smells, ect) to help others. Anyone who is even slightly into science, especially death has to listen to this book. The title is a bit misleading; it's not all about the body farm. It's full of great facts, and the author tells many of his stories and experiences, that are fun to listen to. It was very interesting to hear of what people try to get away with and eventually get caught by Doctors like him on the case. I highly recommend it, a good read. I really enjoyed this book! I was never bored, and I found it fascinating and educational. I thoroughly enjoyed the narrator as well. I highly recommend this book! GREAT . . . thoroughly enjoyed this book. Dr. Bass has made a real difference in forensic science by starting this facility. Some may find it gruesome, however, it is the one certain thing that will happen to ALL of us in life - DEATH. The knowledge that has come from the research and experiments done at the "Body Farm" has given families the much need answers they seek. He is quite an interesting character personally too; I'd love to know him personally. My title is a little harsh. This was more than bearable, it was pretty good. It just wasn't what I expected. It reads more like an autobiography than a tale of true crime and forensic science. In saying that, it is then autobiography of the guy who literally wrote the book on forensic anthropology. The narrator did help make this a better listen than it would have been. Decent story, some useful information and a GREAT narration makes for a 3 star selection. I selected this title out of curiosity and listened to it all the way through. There are some aspects that are interesting to learn such as how scientists can pinpoint the time of a murder or how insects found at the murder scene can reveal clues to track down the killer. I must warn you though, if you are easily grossed out, don't pick this one.